As the hair removal experts for more than 40 years in the industry, over 100,000 individuals of all skin and hair types have completed treatments successfully with 100% guaranteed smooth results! After years of struggling and suffering through painful and regular waxing sessions, as well as conventional electrolysis- which resulted in nothing but scars and damage to the skin, Lucy Peters, a NYC woman, devoted decades of research and development in pursuit of creating this safe, effective, and technologically progressive integrated system. 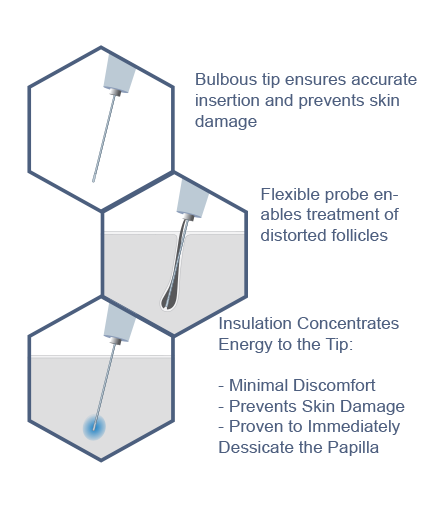 Introducing The LPS 33 Epilator, a flexible needle-like probe sending an RF current into each and every single hair follicle, desiccate the blood vessels, and seamlessly eliminating any future hair growth, the FDA immediately recognized the immense value. No surrounding skin tissues is touched or effected during the process, alleviating any concern of injury or scarring and leading to desirable, and improved skin safe for all skin and hair, types and colors! The Smooth System™ is both a medical & aesthetic solution. With a flawless record of advanced achievement for over 40 years, The Smooth System™ has been the beauty and aesthetic spaces best kept secret. Over 100,000 satisfied clients and counting are a true testament to the Lucy Peter’s vision of becoming serious about smooth. The Smooth System™ is the only FDA approved, proven permanent hair removal treatment in NYC. Unwanted Body or Facial Hair? Have you tried laser hair removal or electrolysis with poor or no results? Were you told your skin color or hair type will not respond to lasering or electrolysis? With The Smooth System™, you’ll have the smooth, hairless skin you’ve always wanted. Primarily offered as the right solution for all skin and hair types from the neck up- especially requested as the proper effective solution to treat women’s facial hair. Many people choose hair removal treatments; there are thousands of laser hair removal clinics and aesthetic practices in the New York City area. Unfortunately, few deliver the results they promise. Not only does The Smooth System™ guarantee removal of every hair, everywhere, on everyone, but it also improves the overall texture of your skin’s surface for the cleanest, smoothest permanent results! Exclusive to the LP brand, The Smooth System™ is the ONLY FDA approved, proven permanent hair removal treatment in the world. Our distinguished, affordable, patented, guaranteed The Smooth System™ leads the forefront of the aesthetic industry! The Smooth System™ is the only true permanent hair removal treatment plan on the market in New York City to not only rid yourself of the unwanted hair, but provide flawless, healthy benefits for your skin on the treated area. Unlike alternative methods, laser hair removal, reduction or electrolysis, the LP system can be used to treat any area of the face or body, as well as all hair colors and skin types. During your complimentary consultation in our NYC office conveniently located at 150 East 58th Street in New York 10155, a certified technician will assess the targeted areas and address your concerns. A unique and customized plan based on a variety of factors will be implemented including the amount of hair and the type of hair surfacing each designated area. Our experts will deliver you with an exact number of sessions required to remove all unwanted hair and fulfill your desired expectations with a quoted cost. As a courtesy, The Smooth System™ technicians will even secure each patient with continual sessions at no addition cost if optimal results are not met within the sessions originally allotted. With 50 years of available record success on over 100,000 satisfied clients, The Smooth System™ is more than a promise, but a 100% guarantee! How does The Smooth System™ work? The Smooth System™ strategically removes one hair at a time. Triggered energy is applied to destroy the root of actively growing hairs ensuring they desiccate the hair follicle and never grow back. Experience the immediate & permanent results which no other method can achieve! No individual or area of the face and body is excluded from potential treatment. You are still considered an ideal candidate even if you have been subject to previous hair reduction treatment. The LP System will only enhance your results by forever ridding your unwanted hair with the initial results and boost of confidence you deserve! We look forward to serving you with a complimentary permanent hair consultation at our NYC office in the near future. Please call 212-486-9740. We guarantee that all hair will be permanently removed in the exact number of sessions and for the cost quoted. If any additional sessions are required in the treated area, we will provide you continued treatment at no additional cost. What areas can be treated with the Smooth System by Lucy Peters? How Much Does The Smooth System Cost? During your complimentary consultation, a certified technician will assess your hair removal needs and provide you an individualized, exact plan and quote. Your treatment plan will include the number of sessions required to remove all hair in that area and exact cost. The Smooth System by Lucy Peters treatment is unique to each patient due to area, amount of hair, and type of hair. How Does Hair Removal with The Smooth System Work? The Smooth System by Lucy Peters removes only one hair at a time; the energy destroys ONLY the root of these actively growing hairs so they will never grow back. This means you experience immediate and permanent results — no other method of hair removal can do this! Does Hair Removal with The Smooth System Hurt? The Smooth System by Lucy Peters treatment method is painless and cannot damage your skin.